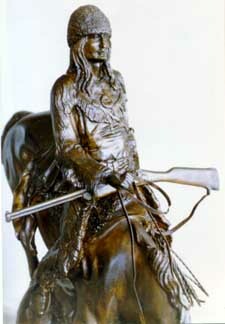 A three-quarters life size bronze bearing a forged Remington signature. Several of these have emerged in Europe. Frederic Remington (1861-1909) cast 22 different subjects. 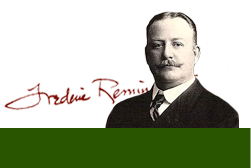 The first foundry with which he worked was the Henry-Bonnard Bronze Company in New York. Four different sculptures were cast in bronze, starting in 1895, using the sand-casting method. They were The Broncho Buster, The Wounded Bunkie, The Wicked Pony, and The Scalp. In 1900 Remington began working exclusively with the Roman Bronze Works, New York. They produced his bronzes using the lost-wax bronze casting process until his death in 1909. Remington's widow, Eva, authorized the foundry to continue casting Remington's bronzes, until her death in 1918. By direction of Eva Remington's will, the foundry destroyed the molds shortly after her death. In 1923 this Museum opened, holding Eva Remington's collection of Remington's art and archives. The institution maintained the copyrights on Remington's bronzes until they expired in the 1960s. Illegal forgeries were made starting soon after Eva Remington's death. Since the copyrights expired, there have been copies in just about all shapes, sizes, colors, etc. Some places are even making bronzes that Remington "might have made if he had lived longer." There is no law governing the manufacture of these copies even though many of them clearly say, "Copyright by Frederic Remington" on them. The words "authentic" and "original" do not apply to Remington bronze reproductions. If you are wondering whether something is original or not, consider the price that's being asked and the circumstances under which it is being offered for sale. Sometimes Remington bronze reproductions are offered as "vintage," "older," "signed," "estate," and "original," when none of these words apply. Buyers are often urged to spend far more than the reproductions are worth. Generally, authentic Remington bronzes are not available anywhere for less than $75,000. Here are two things to look for to reassure yourself further that a particular sculpture is not an original Remington bronze: 1. foundry mark. Most copies bear no indication of where they were made. Authentic sculptures are made with the foundry's name clearly cast into the bronze base. 2. In very few instances will an authentic cast be mounted on a marble base. Copies are frequently mounted on them. There is always great curiosity about numbering. Original bronzes are numbered sequentially. They were made and numbered more or less according to the demand, i.e. 1,2,3, etc. not 1/100 or 19/50. Many copies are misleadingly numbered in this second "3/100" fashion. The location of the number on original sculptures is usually under the bronze base. Since most copies do not bear the name of the foundry that made them, it is a total mystery where and when they were made. The most common method is for a sculpture to be reproduced is for a sculptor to look at photos of an original bronze and make a model in wax or clay. A mold is then made from the model to cast the copies in bronze. The other method, which brings better results, and the one which many companies would like you to believe they use, is by making recasts (also called surmoulages). To make a recast, an original sculpture is needed (although we're sure there have been copies made of copies). Technicians take the surface impression of the sculpture with latex, then make a mold from that impression with which to cast copies. Using either method, details are often added that Remington never intended. The presence of elaborate detail is not an indication of authenticity. This reproduction version of The Mountain Man is one of many recently made version. This one belongs to a private collector in India. Our information on what these facsimiles cost comes mostly from callers who have seen them for sale or have bought them. They seem to range from a couple hundred to several thousand dollars. They do not appreciate in value and should not be purchased as an investment. We suggest going to the library and looking for advertisements in many periodicals, such as Southwest Art, The Wall Street Journal, and a great variety of art and antique magazines. You should find a large array of companies selling their copies. Order and compare their literature. Our Museum Shop offers a selection of bronze reproductions ranging from full size to miniatures. This Museum currently ​offers two​ very fine​ ​reproductions of Remington sculptures, The Broncho Buster and The Rattlesnake, ​produced from digital scans of two of the finest original casts, ​created under direct supervision of Remington Museum Director Laura A. Foster. These ​superb reproductions are ​available only through us, and marked ​with our name and the cast number. For information on the reproductions sold in the Frederic Remington Art Museum Shop, browse our on-line catalog. The location of almost all of the original Remington bronzes is known. When original bronzes are sold, it is almost always either at auction at Sotheby's or Christie's in New York or through a handful of galleries that specialize in Western American Art, such as Mongerson Galleries in Chicago, J.N. Bartfield Galleries in New York, Gerald Peters Galleries in New York and Santa Fe, and Graham Galleries in New York. To learn more about Frederic Remington and his original bronze sculptures requires time spent at your local library or art museum. The body and history of his work is too complicated to be addressed in a letter or phone call. We recommend the following reference: Icons of the West: Frederic Remington's Sculpture by Michael D. Greenbaum, available in our Museum Shop.